Alex & Dylan tied the knot on Thanksgiving weekend 2017 where they met and began their love story. 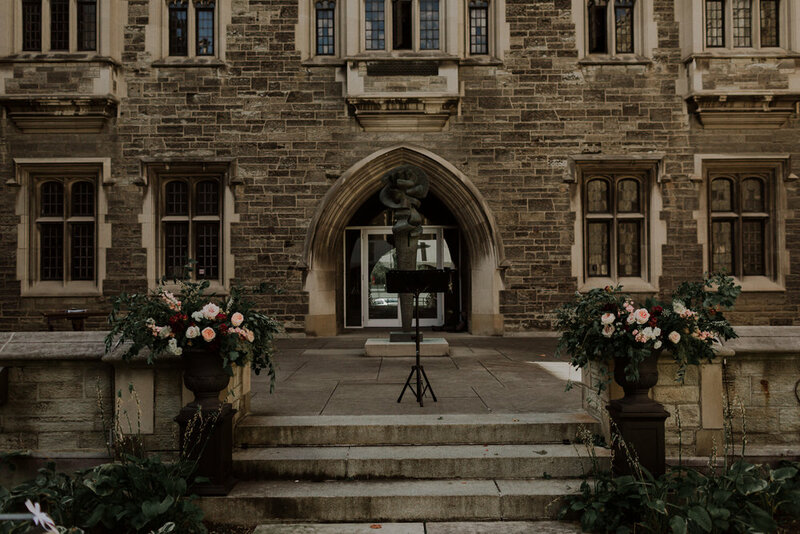 On a sunny October day, Alex walked herself down the aisle at the University of Toronto Hart House courtyard in an avant-garde ode to her powerful femininity and strong, independent character. She wore a soft silk, open back gown from Loversland, flowers in her hair and a cape handmade by her grandmother. 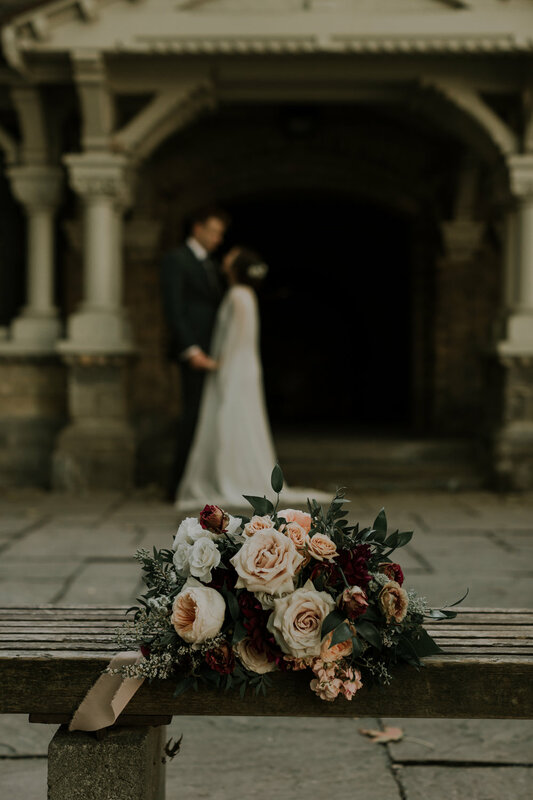 She carried a romantic, rectangular, organic shaped bouquet featuring burgundy dahlias, Juliet garden roses, brown lisianthus and chiffon ribbon tails. 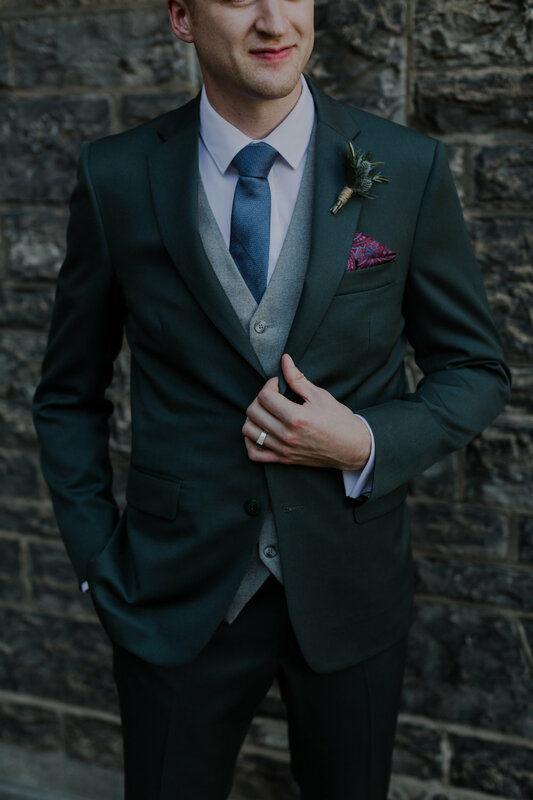 Dylan wore a thistle boutonniere (the national flower of Scotland) wrapped in twine while his groomsman wore clusters of greenery and herbs on their lapels. Large, organic urn arrangements on black pedestals framed Alex & Dylan as they said their vows. The ceremony was romantic and light-hearted with smiles all around. 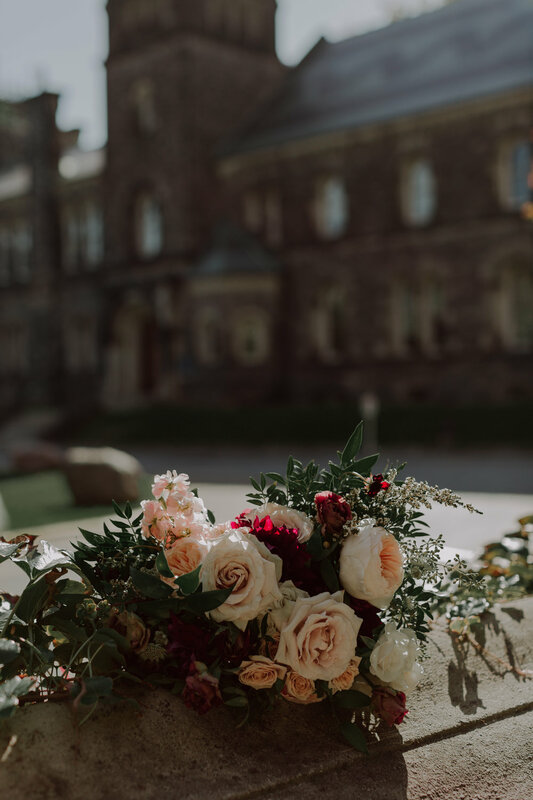 Their celebration of love continued at The Loft in the historic Toronto Distillery District where the wedding reception took place. The room was warm, filled with lush greenery, hanging string lights and lots of candlelight. Their long rectangular harvest tables wore green garlands using Italian ruscus, eucalyptus and bay leaves with pops of white spray roses. The bridesmaids’ bouquets and ceremony urns were repurposed in the room to emphasize their wild, romantic theme. Instead of a traditional head table, Alex & Dylan chose to sit among their guests and closest family. To distinguish their seats, we adorned their chairs in a green hanging garland with asymmetrical clusters of blooms and hanging “bride” and “groom” signage. We also added a cluster of flowers to their welcome signage to match. Their reception was lively, down to earth and eccentric, a true representation of their values and who they are as a couple. Ally + Nicholas Photography is responsible for the lovely photos I have to share today. Their sweet and glowing personalities really made the day so delightful. 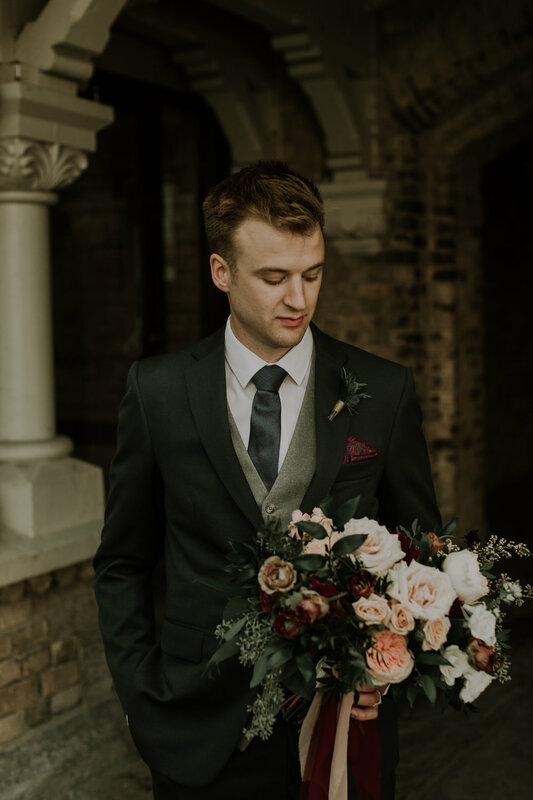 They also tapped into one of my secret obsessions – photos of grooms holding bouquets! For more information about Alex & Dylan’s wedding or to schedule a consultation, please click on the “Contact” page above.